The new Multnomah County Central Courthouse has now reached its full height of 325′. The Oregonian reported that voters approved a $652.8 million bond for affordable housing in the Portland metro area and a constitutional amendment which will allow funds to be leveraged with private money and federal tax credits. The Daily Journal of Commerce reported on the demolition* of one of the old Oregonian publishing buildings, which is making way for Canvas at the Press Blocks. The Oregonian took a look inside one of the units at The Carson in Slabtown. The last structural beam has been lifted to the top of the new Multnomah County Central Courthouse, reports the Oregonian. The Beatrice Morrow, an affordable housing development targeted to displaced residents of NE Portland, has opened on NE Martin Luther King Jr Blvd. The Portland Diamond Project has withdrawn their offer for the Portland Public Schools Site, to clear the way for the Albina Vision. The group says they will announce a preferred location for an MLB stadium site by end of the month. Eater Portland took a look at the menus for the Radisson Red’s Ouibar and Kitchen, which will be located in the Broadway Tower. 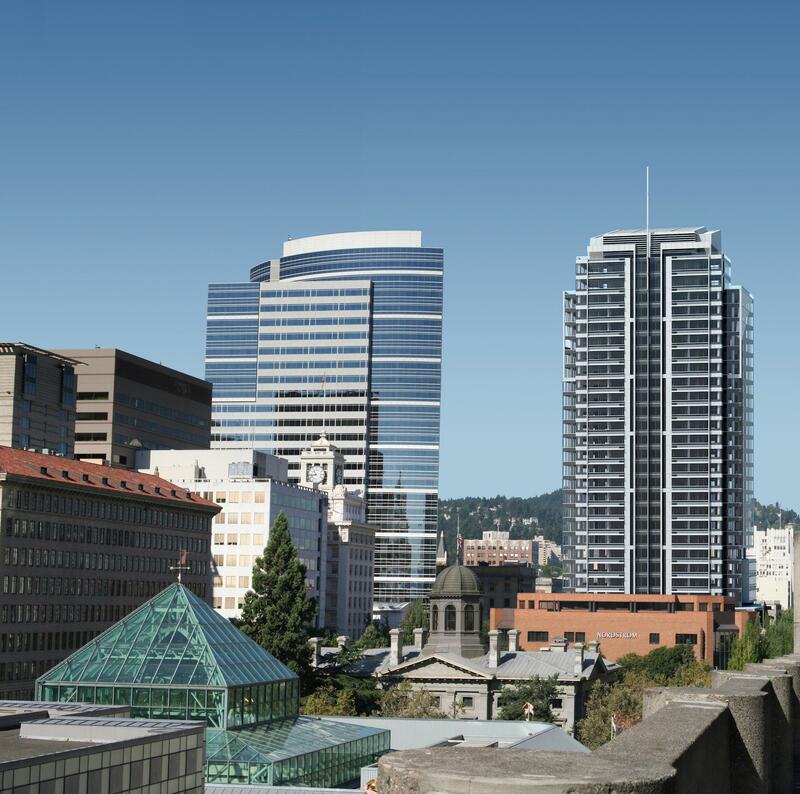 The GBD Architects designed Block 216 tower would rise to a height of 455′, making it one of the tallest buildings in Portland. 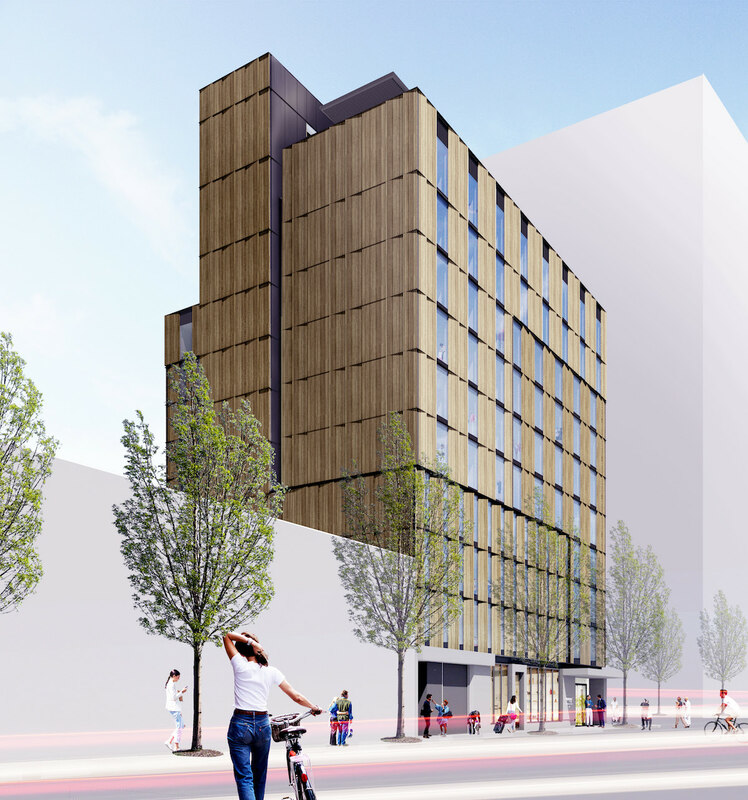 The Oregonian published the latest images of Block 216, the hotel, office and residential tower proposed for the 10th & Alder food cart block. The Daily Journal of Commerce reported that the project team faced tough questions from the Design Commission at its second Design Advice Request hearing*. New construction has sent a flood of new apartments onto the market, leading to a month’s free rent becoming standard, writes the Willamette Week. The Willamette Week reported that The Carson “appears to be among the first apartment complexes in the U.S. to feature Amazon smart-home technology in every apartment“. The Portland Art Museum Rothko Pavilion has been redesigned to incorporate an open passage between the Park Blocks and SW 10th Ave, writes the Oregonian. Portland Monthly wrote about the District Office, the six-story, cross-laminated timber building that “reflects a booming Central Eastside“. 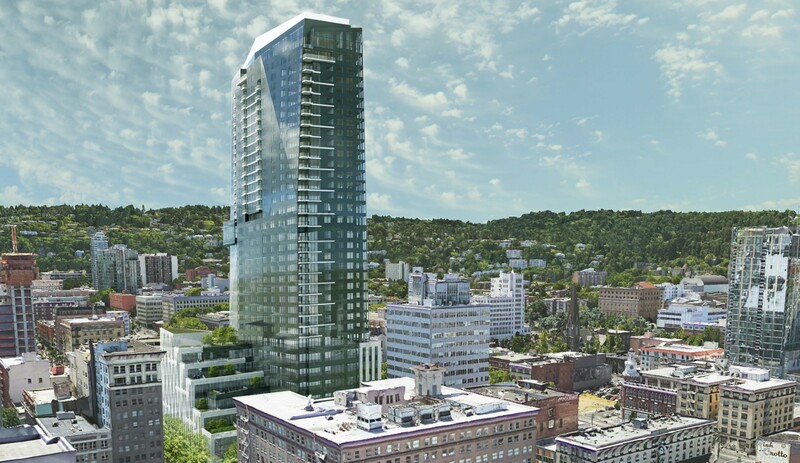 The Overlook Neighborhood opposes new rules for how developers notify neighbors about coming construction projects, reports the Portland Mercury. The Willamette Week reported that Oregon GOP gubernatorial candidate Knute Buehler opposes the Metro housing bond. The Portland Development Commission received three offers for Centennial Mills, according to The Oregonian. All three offers, valued at $1,000, $100,000 and $3.45 million, were rejected. The redevelopment agency will now consider “how/whether to reengage the market”. The DJC reported that the under construction Overlook Pointe condominium development at 5425 N Minnesota Ave was burned down in a fire* early Wednesday morning. The PDC voted to sell property at 1053–1201 NW Naito Parkway to The Wolff Company for $9 million. The Oregonian reported that the developer plans to build 340 apartments on the site, 68 of which would be affordable for at least 10 years. KGW covered the 1,200 apartments coming to the area in and around the Con-way Masterplan area in NW Portland. Construction is underway on Blocks 294E and 295E and the Leland James Building, which are following on from the LL Hawkins and Slabtown Marketplace. Immediately outside of the masterplan area is Q21, which is nearing completion. The Portland Tribune wrote about the “new mood in Chinatown“, which after decades of divestment might be seeing a change in its fortunes. The Society Hotel opened last year, and will soon be joined by the newly renovated Mason Erhman Building Annex, Overland Warehouse Company Building and Grove Hotel. The Portland Mercury profiled Swift Real Estate Partners, the San Francisco Investment Firm that is “Snatching Up Old Town Real Estate“. The company’s acquisitions include the New Market Theater, a historic building adjacent to the Skidmore Fountain that could receive a significant addition. Project^’s Field Office will create a “300,000-square-foot urban campus“, according to the Portland Business Journal. Construction recently started on the Hacker-designed buildings at NW Front and 17th. More than 1,000 people applied for the 65 housing units available to people displaced from North and Northeast Portland, according to The Oregonian. The City is planning a $25 million renovation of the 10th & Yamhill Smart Park, according to the Portland Business Journal. The scope of the project will include addressing seismic and ADA deficiencies in the existing structure. Three new surf shops are set to open in the next year, reports The Oregonian. These include Cosube, which will open in Slate at the Burnside Bridgehead, and Leeward Northwest Surf & Sea, which will open in New New Crusher Court at 2450 NE Sandy Blvd. According to the Portland Business Journal, furniture retailer Room & Board will open next year in the Pearl District’s newly renovated Fisk Tire Company Building. The Business Tribune wrote about a day in the life of the team at OHSU working on the Knight Cancer Research Building. The DJC reported* on how development fees are stacking in Portland, potentially affecting the viability of projects currently in development. 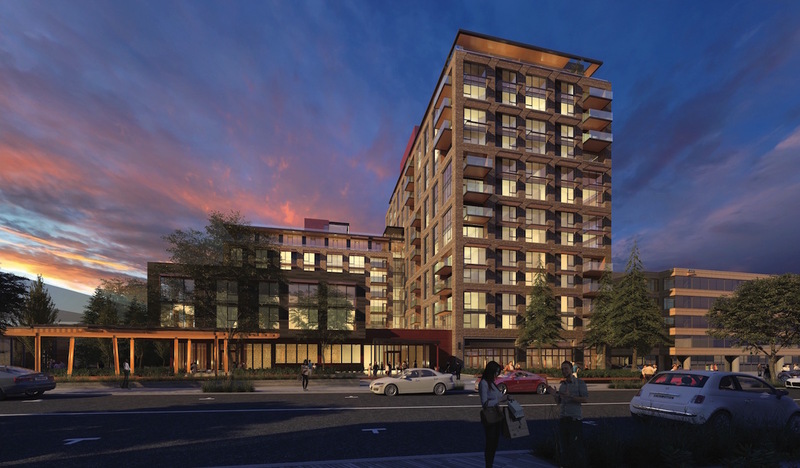 After two Design Advice Request hearings earlier in the year, Ankrom Moisan Architects’ 1430 NW Glisan has now been submitted for Design Review. The Business Tribune took a look at how the building has evolved. The Portland Business Journal covered the 64 apartments about to go up on the site of the former Macadam’s Bar & Grill at 5833 SW Macadam. 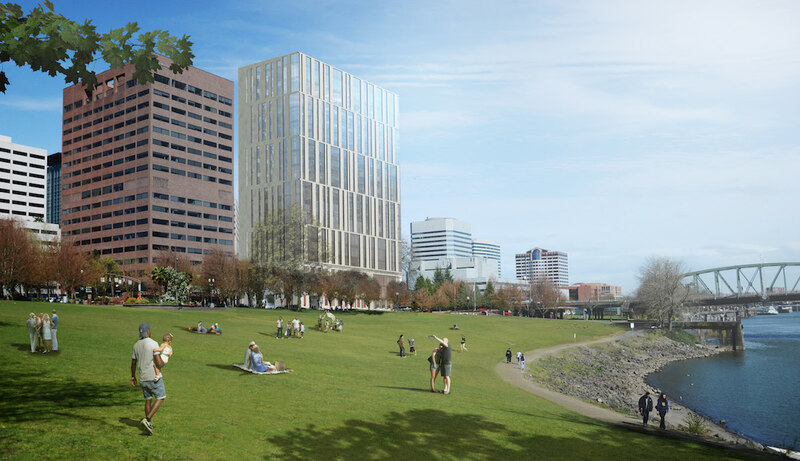 With a Pre-Application Conference scheduled for development on the Prometheus Property in South Waterfront—which could include 4 buildings, of 200 to 300 apartments units in each—BikePortland wrote that the “dominoes keep falling for a continuous river path in South Waterfront“. The Oregonian reported on the shortlist for the new director of the Portland Development Commission. 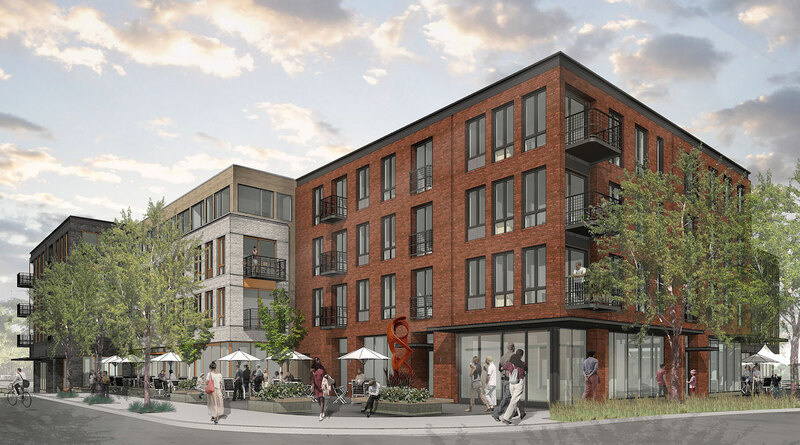 With development exploding in and around the Con-way Masterplan area, the Portland Business Journal took a look at completed and planned buildings at the far end of the Northwest District, including the LL Hawkins, Q21, Leland James Building and Blocks 294E and 295E. The Oregonian wrote about how a conflict-of-interest probe marks the “latest chapter in Yard building saga”. This post is an updated version of a post originally published on November 13th 2015. Construction is underway on Blocks 294E and 295E at the north end of the Northwest District. The buildings by GBD Architects and Jones Architecture respectively, for developer Cairn Pacific, will include 385 residential apartment units and nearly 20,000 sq ft of ground level retail space. An underground garage stretching below both blocks will include 600 car parking spaces. Half of the parking spaces are a replacement for existing XPO Logistics (formerly Con-way) employee parking. Parking for 553 bikes will be provided. New construction of two new five story apartment buildings. Pre-application conference to discuss a 14-story, mixed use project with 2.5 levels of structured podium parking. Adjustment requests for height (max story limit) and rear lot line setback requirements for the development of a 4-story, 39-unit apartment building. New 6-story mixed-use building with 145 apartment units on the EX portion of the site, below grade parking for the residential units and additional tuck-under parking. An excavation and shoring permit was issued to GBD Architects for Con-way Blocks 294E and 295E. 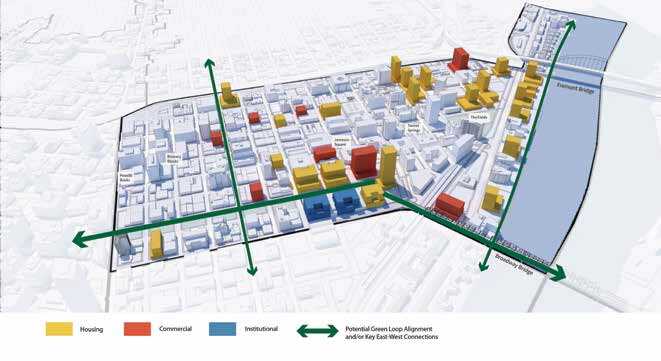 Image from the Discussion Draft of the Central City 2035 Plan, showing a possible development scenario approximating future growth in the Pearl District over 20 years (Bureau of Planning & Sustainability). At least two of the sites shown as potentially developable have current proposals on them. It is just over a year since Next Portland last did a roundup of the tallest buildings planned or under construction in Portland. At that time, we counted 25 buildings over 100′ in height planned. Today we count 40. Given the length of time it takes to complete a high rise building, many of the buildings on the 2016 were also on the 2015 list. Four buildings are no longer on the list this year, due to having been completed: Block 17, Pearl West, the Aster Tower and Park Avenue West. Seven buildings that were still in the design phase last year are now under construction. No building on last year’s list is known to have been cancelled. Read on to see our complete list. Where possible, the heights given are the building height as defined in the Portland Zoning Code and published in the Design Commission’s Final Findings. In some cases the heights have been estimated. Pre-app conference for reconfiguring freight elevator on NW Flanders frontage with ROW encroachment; remodel of existing office space with option to add approx. 6,000 sf penthouse on the roof. 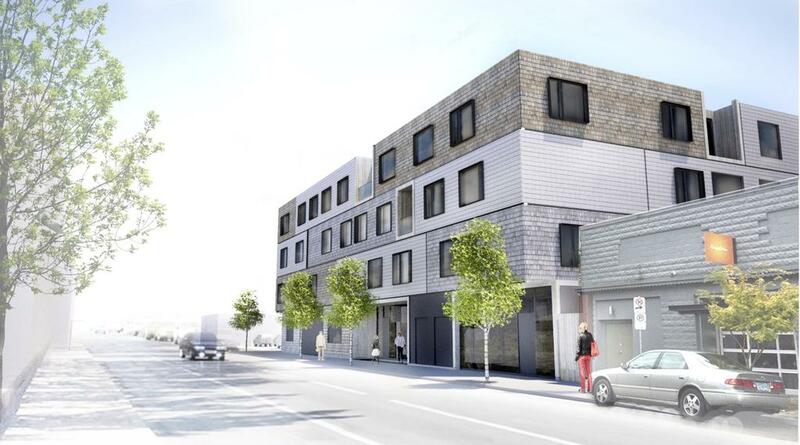 New 6-story, 54 unit residential building with ground floor retail and 18 parking spaces. 2 modifications: parking space width and bicycle stall width. Historic resource review with adjustment to reduce the number of loading bays from 2 to 1 and a modification to change loading bay size from type A to type B. Project is for new construction of 74 room vacation ownership property, six floors on existing parking lot. 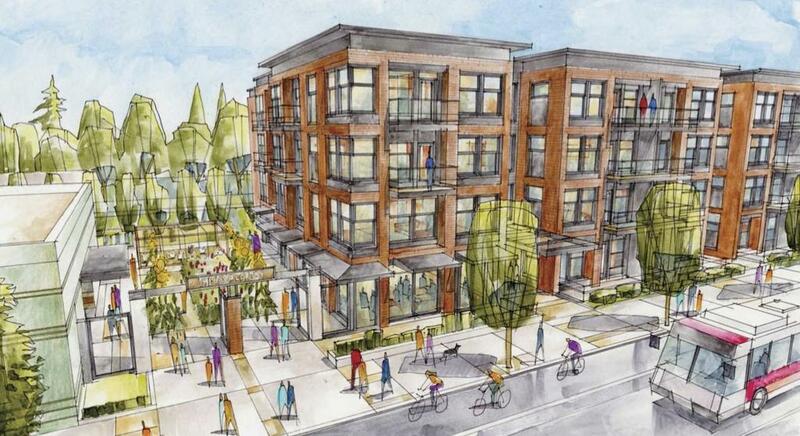 Early assistance for dormitory development at University of Portland. 2 new mixed-use buildings – over a continuous 2 block underground parking structure. Type 3 Design Review with 4 modifications. New 3 story apartment with 20 units; associated site work. Full standard 13 sprinklers required. It’s now almost 6 months since the first post on Next Portland. Since then we’ve published over 180 posts and added over 350 projects to our map, which is a testament to the staggering scale of development happening right now in Portland. Much of this development is 4-6 story buildings along the corridors such as N Williams and SE Division, but there is also a large number of tall buildings going up in the Central City, which why we decided to list the 25 tallest buildings planned or under construction. While the boom of the 2000s was defined by the activity in South Waterfront, today that district has no apartments or condos planned over 6 stories tall. By contrast the Pearl, the Lloyd District and the Central Eastside are all seeing their skylines altered. Activity in Downtown has quieter, but it also has the tallest building in our list, which is now the 4th tallest building in the city. Where possible, the heights given are the building height as defined in the Portland Zoning Code and published in the Design Commission’s Final Findings. Where indicated the heights have been estimated.